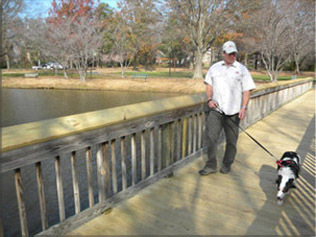 Specially trained Border Collies offer an environmentally friendly and compassionate way to manage problem geese. Their instinct is to herd, not attack. They can quickly persuade even the most stubborn geese that future peace can only be obtained by finding another place to live. When these dogs are given special training to exacting standards, they can be used as a safe and humane way to remove problem geese. 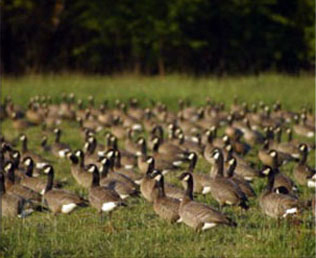 Their famous "predator stance" combined with an intense gaze or "eye" can quickly intimidate the geese into leaving. Geese that go into the water are followed by the Border Collie, making them eventually feel so unsafe that they choose another place to live and hang out. This method works and will keep working! People who have spent years trying to rid themselves of geese are so delighted to see us arrive they stop to watch us work and meet our dogs.